Now check Central Bank of India (CBI) mini statement on your phone online through SBI mobile banking application. You can view the last 5 transactions details of your CBI account. Central Bank of India also offers missed call banking facility to check account balance and mini statement. 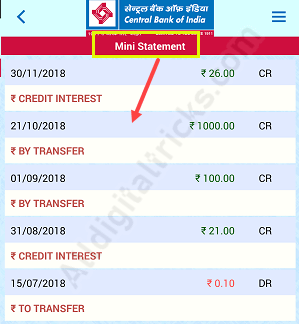 Here we will tell you how to check CBI account mini statement online through Cent mobile banking application. After registering for Mobile Banking, now you can check your account mini statement online from your phone. 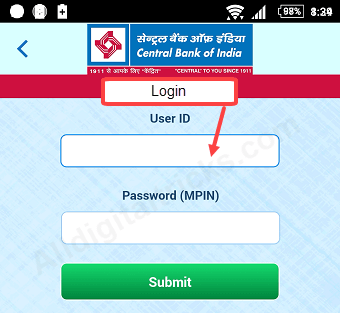 (1) Login to Central Bank of Idia Mobile Banking. Enter your Username and login Pin. (3) Now tap on Balance Enquiry/Mini Statement and next screen tap on Mini Statement. And next screen, you can check the last 5 transactions (Credit/Debit) details of your account. 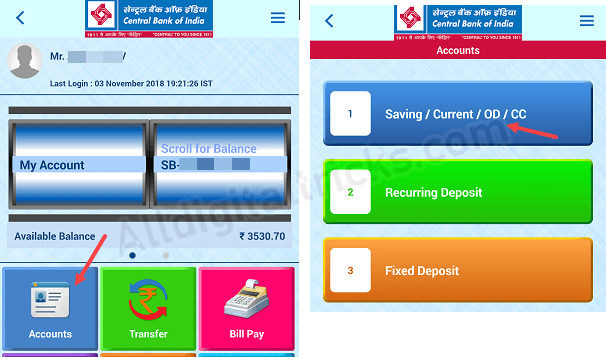 Central bank of India customers can also activate CBI mPassbook facility on his/her phone to view passbook on the Mobile phone. CBI Net banking is another online facility to view account full statement. (1) What is the charge of mobile banking? – Cent Mobile banking is free service, just install the application and activate for your account. (2) Do I need to visit Bank for Mobile banking activation? (3) What is Customer ID of my account? – It is your account customer ID. You can check online through net banking or visit the branch to know about your customer ID. Now, whenever you want to check your Central Bank of India (CBI) account transactions activity, no need to visit Bank. Just Open Cent mobile banking and check your CBI account mini statement from your mobile phone.